The Philippines' largest internationally owned and operated hotel brand – Tune Hotels – has continued its impressive expansion in the country with the opening of the 200-room Tune Hotel Aseana City. Located in the heart of the Aseana City in Paranaque, the property is the ninth Tune Hotels to open in the Philippines in the last two years after Angeles City, Ermita, Makati, Cebu, Davao, Cagayan De Oro, Quezon City and Ortigas. 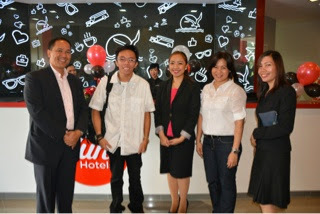 The hotel is perfectly located for both business travellers and leisure travellers to the area and Sahlee Zaldivia, who is the Country Head for the hotel’s owner – Red Planet Hotels, said this Tune Hotel (www.tunehotels.com) in a newly-developed precinct of Manila, will further strengthen the company’s confidence and commitment to the country’s tourism industry. “The Aseana City precinct continues to grow and is fast becoming one of the country’s newest and most impressive lifestyle and travel destinations, the perfect location for the Philippines’ latest Tune Hotel and our ninth overall in the country,” Ms. Zaldivia said. The next Tune Hotel to open will be the 189-room Tune Hotel Ayala Avenue in November 2014.The expansion will allow the company to take advantage of the 24% growth in tourist arrivals projected by the Department of Tourism for 2014. “We are fully committed to helping expand, and grow with, the international and domestic travel industries in the Philippines,” Ms Zaldivia said. Red Planet Hotels Chief Executive Officer, Tim Hansing said even more sites are being sought to build new hotels in the Philippines. “We see the Philippines as the perfect platform to drive the South-East Asian expansion of Tune Hotels because of the country’s acceptance and embracing of new and inspiring brands that enable travel to the wider population,” Mr Hansing said. 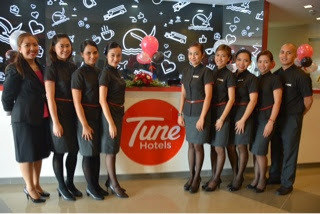 Since its establishment in Malaysia in 2007, Tune Hotels has 42 operating hotels worldwide in the Philippines (9), Malaysia (12), Indonesia (9), Thailand (4), England (4), India (1), Japan (1), Scotland (1) and Australia (1). Red Planet Hotels Limited was formed in 2010 and is a privately owned regional hotel investment company focused on Asian markets by developing a portfolio of hotels in the Philippines, Japan, South Korea, Indonesia and Thailand. Red Planet Hotels Limited owns the hotels it operates and they are all managed under a franchise agreement with Tune Hotels. Red Planet Hotels Limited was formed with a vision to capture the growth in the worldwide value hotel market, supported by the growth in budget airlines and the robust economies of the ASEAN region, Japan and South Korea. Red Planet Hotels Limited now has an ownership interest in 36 Tune Hotels either in operation or under development. Tune Hotels is part of the lifestyle business conglomerate Tune Group that was founded by Tan Sri Tony Fernandes and Dato’ Kamarudin Meranun. Since launch, Tune Hotels has welcomed more than seven million guests in its properties throughout Asia, Australia, India and the United Kingdom.